I’ve finally finished and framed my Intro to Cross Stitch sampler! 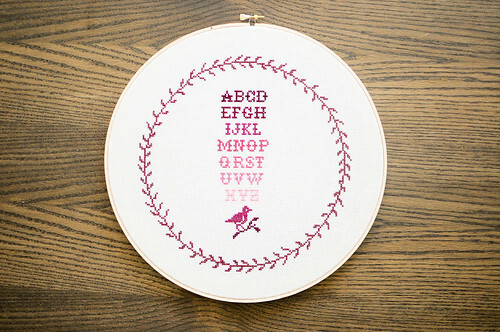 I had finished up the alphabet part of the sampler during the class, but was determined to frame it in a hoop and wanted to do a round border around it. Lucky for me, Johanna accepted my special request and designed this sweet leafy round border. Since this border is round and the pattern is actually quite random, it took a little bit longer for me to stitch. 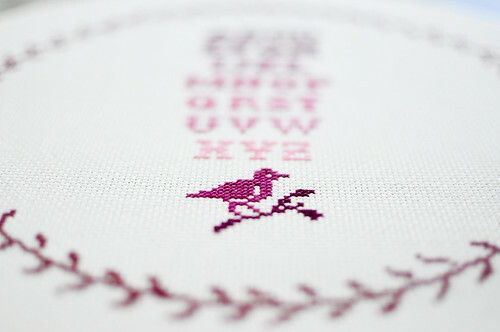 The rectangular border that Johanna also designed for the class is a much easier border to stitch since it is repetitive. I hardly ever like to take the easy route, especially when it comes to aesthetics. To be honest, I miscounted when I was more than halfway done and had to take out quite a few stitches. The end result is totally worth it. I am so proud of how my sampler turned out. It’s now hanging on the wall at the workroom, so if you’re in the shop you can see it in person. 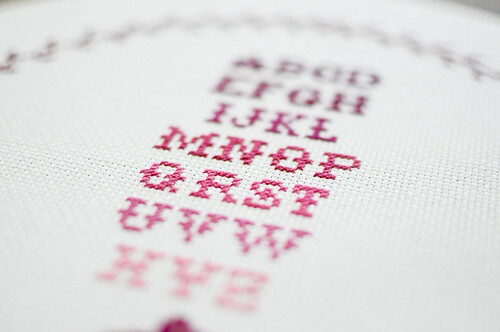 Cross stitch appears to be a fairly easy form of needle work. The reality is that there are always mistakes to avoid and tricks to learn that make any new craft so much better from the very start. Tricks and tips are Johanna’s specialty! I don’t know how she does it, but man! are we lucky to learn from her. (psst! have you seen her new class?!) What I didn’t realize about cross stitch was that it requires some strategic thinking to keep your work tidy on the back side. I found myself feeling like I was playing a game of Tetris, as I was pre-planning my ‘moves’ (aka stitches) with my needle. I totally enjoyed this aspect of cross stitching. Also! I really had a chance to get a feel for the new Cosmo embroidery floss we got in. I love it!! Firstly, we have 443 colours, so the possibilities are endless. Secondly, the cotton floss is so silky and totally doesn’t tangle. The other thing I’ve recently started using are needle threaders. They make all the threading in hand quilting and needle work SO much easier. 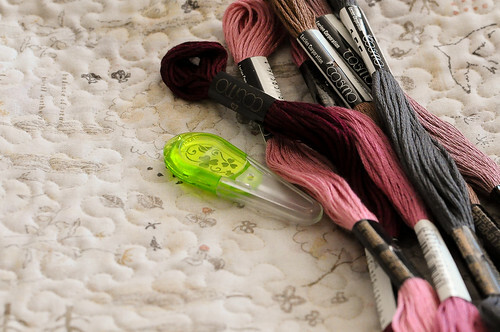 Clover makes a floss embroidery threader and it is now a permanent part of my sewing kit. Your sampler looks amazing. I really love the round leafy border – it’s perfect. You’re always showing me new things I want to learn! 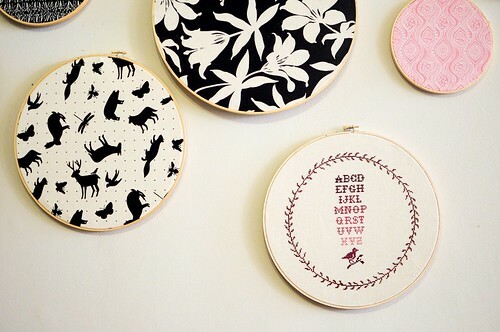 Who knew the alphabet could be so pretty! I’m on a finishing mission, so I will have to wait until the summer, but it seems like the perfect project to take outside to the backyard with some lemonade. Any chance of sharing your secrets and providing a pattern for the border?? Pretty please with a cross stitch cherry on top.